The ultra-fast and flowy multi-use trail system at Lake Norman State Park is also among the longest in the area. Without few technical features and plenty of long run-ups, the 30 miles of trail are a great run for getting speed. This is for the Laurel Loop. It's easy to combine any or all of the parks 30 miles. The length of some runs and a couple steep climbs create a bit of challenge. The longest run, the nine mile Laurel Loop also has some of the steepest climbs. Stick to the northern trails for shorter, quicker runs. Trails are open all year. In the language of the Catawba Indians, the word "itusi" means hawk. There couldn’t be a better spirit animal for the fast, swooping trail system that cuts through Lake Norman State Park. With very few technical features, flowing curves, and great visibility, the Itusi trails are super fun to ride. And with 30 miles of singletrack, its easy to spend a whole day on the trails. Thanks to the amazing work of the Tarheel Trailbalzers, the Itusi trail system at Lake Norman State park has, over the years, grown to more than 30 miles long. In all, the system is made up of eight individual loops. The trails on the north end of the Itusi system are generally the easiest. A few hills keep it interesting but for the most part the Hawk, Hicks Creek, and Norwood Creek Loops are the best for beginner riders or a fun warm up for to other longer, hillier trails. The most advanced trail, mostly due to its length and some long climbs, is the Laurel Loop. Like the others, this nine mile path cuts through dense forest allowing for an immediate immersion far separate from the “real world”. 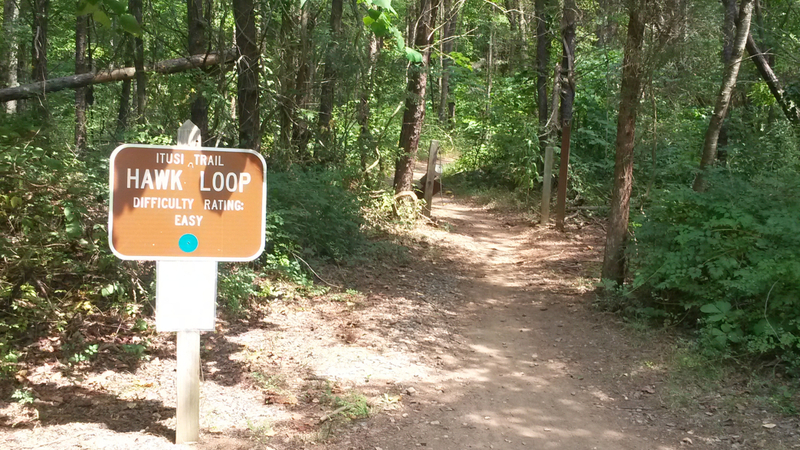 If the Laurel Loop isn’t enough, the Fox and Wildlife loops add a connecting 2.5 and 4.25 miles respectively. Burms, rollers, and other features also make these trails the most interesting for an intermediate or advanced rider. All trails in the Itusi system are hard packed dirt with a moderate amount of roots and rocks. Riders of all levels spend time on the Itusi. 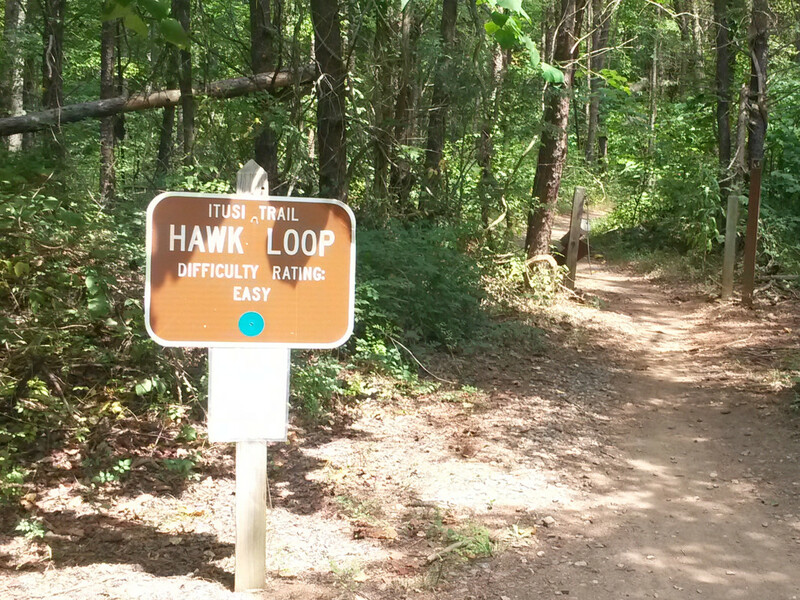 The mostly modest hills of the Hawk loop section and lack of significant technical features mean a newbie rider can get in substantial miles and build confidence. But experienced riders aren’t bored here either. The Laurel loop is one of the best intermediate trails in the area for its combination of climbs, fast turns, and overall length. Keep on State Park Road, the entrance road to the first parking lot in the north end of the park. There is a huge, new visitor center there with bathrooms, drinking fountains, and an interpretive center. While the trails at Lake Norman State Park are long enough to give breathing room on even busy days, it is important to watch for walkers, joggers, and slower riders. Especially on the easier rated trails on the north end of the park. Always announce your approach.